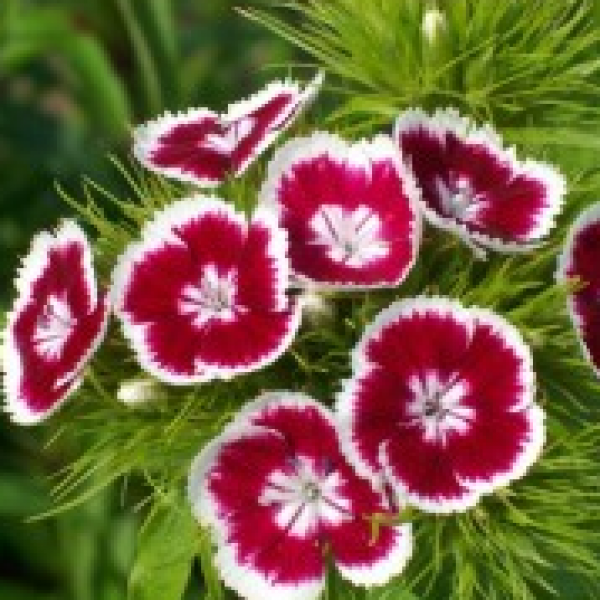 Most dianthus have pink, red, or white flowers with notched petals. Sweet Williams are biennial or short-lived perennials covered with bicolor flowers in late spring. Pinks are low-growing dianthus suitable for rock gardens. Carnations are taller and good for bouquets but tend to be less hardy than other dianthus. Plant in spring or fall, spacing plants 6 to 12 inches apart, depending on the type. Prepare the garden bed by using a garden fork or tiller to loosen soil to a depth of 12 to 15 inches, then mix in a 2- to 4-inch layer of compost. Dig a hole twice the diameter of the plant's container. Carefully remove the plant from its pot and place it in the hole so the top of the root ball is level with the soil surface. Carefully fill in around the root ball and firm the soil gently. Water thoroughly. Apply a thin layer of compost each spring, followed by a 2-inch layer of mulch to retain moisture and control weeds. Water plants during the summer if rainfall is less than 1 inch per week. Stake tall varieties to keep them upright. Remove spent blooms on tall varieties, or shear back mounding plants after bloom to encourage rebloom. After the first killing frost, cut stems back to an inch or two above soil line. Divide plants every 3 to 4 years as new growth begins in the spring, lifting plants and dividing them into clumps.